As we begin to wean the spring calving group of heifers and bulls, I have to pause and reflect on the past seven months since we delivered our first calf of the year. Weeks of long and sleepless nights delivering calves of our largest birthing group yet was a serious grind full of humbling learning experiences. The winter quickly transitioned out of 111 days of snow pack into a spring that culminated with record rainfall, and transitioned just as quickly into a hot summer that broke records for lack of rainfall (80 consecutive days) and days above 90 degrees (18 consecutive days). We have been fortunate to have a better than average harvest, and to be able to grow our recipient herd for a fifth consecutive year. 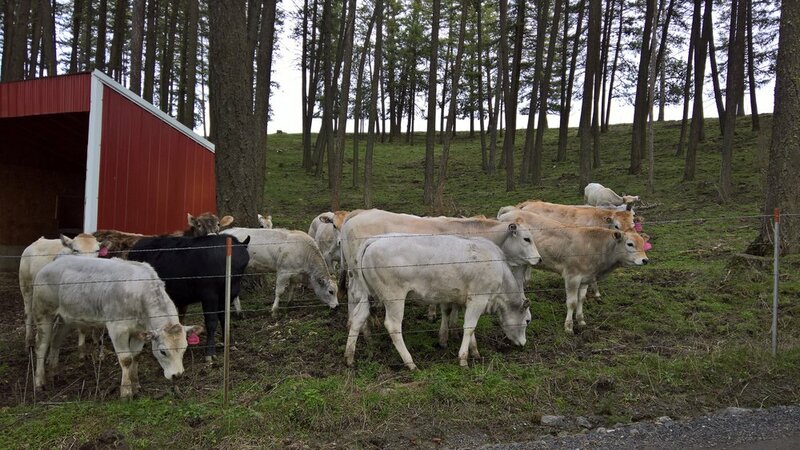 Week 1: We bring the cows with bull calves and cows with heifer calves in from separate pasture and keep the two groups in separate barns during weaning. The first step is to weigh the calves and then put the Quietwean tags in the calve’s noses. We prefer these tags to other products on the market because they are easily installed. Once in, they simply hang from the nose over their mouth to prevent a calf from nursing, without impeding their ability to drink water or eat hay. Even though the calf is unable to get any milk, they remain calm because they are still with their mom. Concurrently, the cow begins to dry up and gets used to the calf not coming to her for milk. All of this amounts to less stress on the cows and calves, which results in no bawling or fence line pacing when the pairs are separated. We have also experienced zero shrinkage or sickness when the pairs are separated. On the nutrition side we place Purina Stress Tubs in the barns for the cows and calves. These tubs have keylated minerals that assist with more efficient nutrient absorption. We also provide the bull calves with 1 lb of Purina Stocker Grower per day for one week. For 7 days the calves remain with their mothers with the nose tags in. Week 2: After 7 days we remove the nose tags and separate the cows and calves. The layout of the barns allows us to use panels to divide the barn into two sections, so that we can essentially fenceline wean from this point. The calves have their own Ritchie waterer, and Sioux Steel hay max feeder. We continue to give the bull calves 1 lb of Pruina Stocker Grower per day. Week 3: The cows and calves continue to fenceline wean inside the barns, but we discontinue feeding Purina Stocker Grower. However, the Purina Stress Tubs remain in the barns accessible to both cows and calves. Week 4: At the culmination of the fourth week we weigh all of the calves again. Then we turn the cows out on winter pasture, move the weaned heifers out to separate winter pasture, and load the bulls onto trailers to take them to Toro Ranch in Nebraska to be put on test. In the spring we will go through the same process with the late summer born calves. the bulls from that group will also make their way to Toro Ranch to be put on test.